…and boy are my arms tired! HAHAHAHAHAHAHA! So! 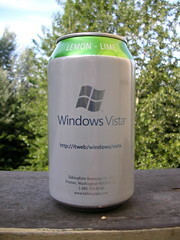 Didn’t know that the current beta of Windows Vista was in carbonated liquid form, did you? Yep, that’s the kind of deep insider information you’ll consistently find here. Hey what are you doing with a blog? Im not suprised by this. Email me through my website poopykins. I’ll know its you and not some internet crank if you include in the topic line the name of you quizzical champions ID.